Windows Phone 8.1 is shaping up to be a real shake up for the mobile OS as it's looking like we're in for changes all the way down to the keyboard. Unleash the Phones posted a new video demoing a new Swype-like keyboard complete with a new emoticon-filled text prediction engine. Similar to Android's Swype keyboard, users can slide their finger across the screen, linking letters together with a thin line while the handset predicts what they want to type. The video also shows how certain words will bring up suggested emoticons such as a smiley face for "happy." 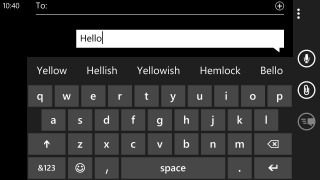 While the video might lack some validity, The Verge confirmed with sources in the know that Microsoft is indeed building a Swype-like keyboard directly into Windows Phone 8.1. It's a big change up for Microsoft to include an additional option over the old hunt and peck-style typing, but users can also disable the feature for traditional keyboard input. Last week a developer on Reddit revealed an almost complete overhaul is on deck for Microsoft's mobile OS. The recent leak revealed the smartphone OS would begin a merger with Windows RT. Along with a more unified mobile OS, Windows Phone 8.1 will also supposedly reassign the back button to slip apps in the background rather than closing them outright. Meanwhile, WP8.1 users will have their hands on new apps for separate video and music, podcasts, a new layout for the default camera, and the recently rebranded OneDrive. The most visible shakeups however will be the additions of a new notification center to match Android KitKat and iOS 7, plus a Siri-like voice assistant called (and voiced by) Cortana. If it all turns out to be true Windows Phone 8.1 might be the most well-rounded mobile OS Microsoft has released. We'll be able to check out all the features when it likely shows up at Build 2014. Microsoft is giving all their OSes a makeover. Check out what's new on the desktop with Windows 8.1.